The recent forecast of GDP growth in Poland for 2018 is really promising. According to the latest prognosis, Polish economy will grow 4.5 % which is the highest rate in Europe. Why the prospects for Poland are so good? There are many factors. As we know from the history books, it has not always been easy for Poland being placed right in between two superpowers, but following the World War II and certainly following the fall of the Soviet Union, Poland has turned this disadvantageous position into a motivator. Poland is expanding and improving in virtually all areas. Poland on its own is too small to play an important role on the international arena but Poland integrated economically with other countries from the CEE region plus the support of the United States for this project - this is something new and inspiring. Poland is perceived as one of the best places to invest and this trend is likely to continue. Therefore, many companies and entrepreneurs around the world will be considering this year an investment in Poland. One of the first question is what is the best business structure on your Polish investment? There is no “one size fits all” answer, and deciding whether you want to run your business in Poland as a partnership, limited liability company, branch or joint-stock company, it could be different answer. If your business is going to operate not only in Poland but in other European countries too, you need to plan in advance how can you fit your business in the complex world of international tax and legal agreements. You need expert advice in all the countries you are going to operate. If you choose a limited liability company as your vehicle for the investment in Poland, you need to decide its name, the number of shareholders, the number of directors and the company’s share capital (the minimum is PLN 5,000). Everything can be handled by your attorneys in Poland. A company has a personality that is separate from the individual who owns the company. The company is the entity that is a party to contracts and the one that makes profits. I will not give you exact answer what it the right business structure for you. 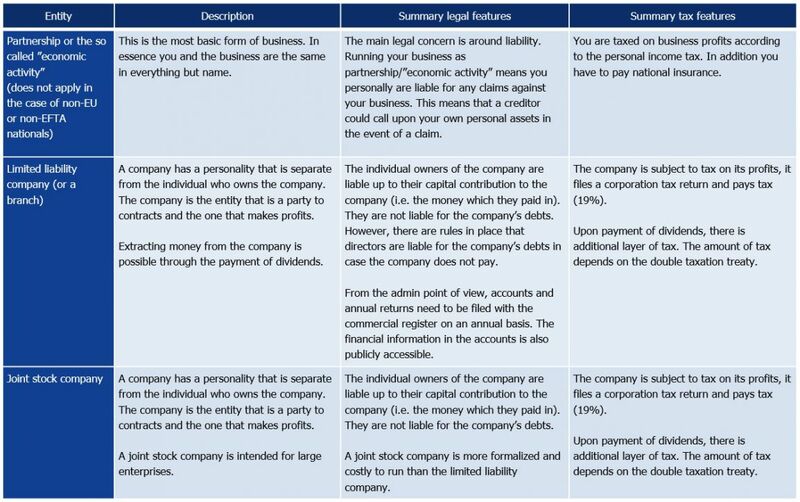 Below, I present some basic information about the most common business structures which are available in Poland, and some of the questions you need to ask before making your mind up, or seeking out the professional help. The most common choice for investors in Poland is a limited liability company which is similar to a German GmbH or Italian societa a responsabilita limitata. What is the right business structure for you and whether a limited liability company will be the most appropriate choice – this should be established by your advisors. Getting things right from the start will increase your chances for a successful investment.